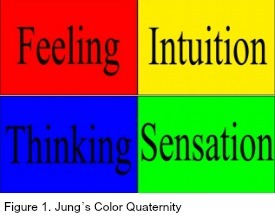 Jung’s thinking regarding the color quaternity was mainly predicated on two empirical sources. The first source was the array of dreams and visions that Jung initially observed in himself and later in his analysands. The second source was the archive of cross-cultural studies, which included his exploration of Eastern traditions. Jung does not seem to have arrived at a mature understanding of the color quaternity until late 1929, which coincided with the publication of his commentary on The Secret of the Golden Flower, wherein he indirectly suggested a color quaternity. 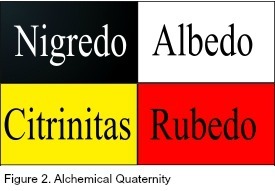 Yet, in this commentary the colors Jung (1929) alluded to are not red, yellow, green, and blue, but black, white, yellow (or gold), and red, which parallel the colors of the four alchemical stages—nigredo, albedo, citrinitas, and rubedo (CW13, para. 220, n. 108) (Figure 2). In his second commentary Jung refrained from calling them primary colors. Author John Irwin (1994) has suggested that at some point in Jung’s career his understanding of the color quaternity evolved. In this way, Jung suggested that not only did the color symbolism change but also the corresponding number symbolism. 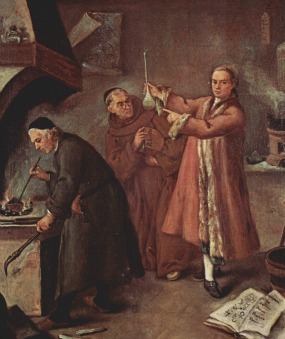 An analysis of the foregoing passage indicates that the reduction of the colors from four to three corresponds to an omission of the fourth typological function, intuition—perception through the unconscious—which the alchemists rendered as citrinitas or xanthosis—the inner light of the soul. The gradual disappearance of citrinitas in the alchemical system suggests a undervaluing of intuition. Thus, Jung’s (1952) color quaternity, as opposed to a color trinity, highlights the problem of the three and the four, or what is also called the Axiom of Maria—“Out of the third, comes the One as the Fourth” (CW 8, para. 962). One of the central aims of Jung’s psychology was to compensate for the number four’s state of neglect during the Christian Era. The number four is a symbol of wholeness, as suggested by Socrates’ original question: “One, two, three—but where, my dear Timaeus, is the fourth?” (Cornford, 1937, p. 9). 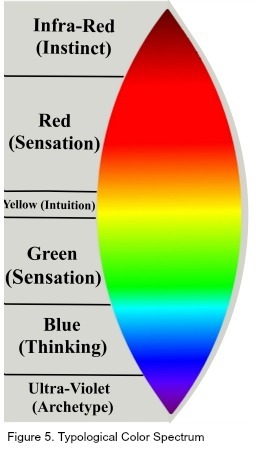 Although in Psychological Types Jung (1921/1971) does not mention a color quaternity—a tetrad of rainbow colors—that corresponds to the four functions, he does correlate three of the psychic functions to a Gnostic typology consisting of pneumatikoi (thinking), psychikoi (feeling), and hylikoi (sensation), but the Gnostic’s tripartite system omitted the fourth function or intuition. So the problem of the missing fourth is also present in Gnosticism. Thus, between 1929 and 1950—when he published “Concerning Mandala Symbolism”—Jung’s thinking on the color quaternity changed. As previously suggested, his re-visioning of the color scheme seems predicated on the symbolism expressed in the dreams and fantasies of individuals on the one hand and Jung’s intense study of Eastern philosophy and religion on the other. Jung’s propensity to connect things together was bolstered by his syncretistic impulse. Elsewhere, Jung provided the following correlation in regards to the symbolism contained in Mann’s pictures: “Red means blood and affectivity, the physiological reaction that joins spirit to body, and blue means the spiritual process (mind or nous)” (CW9i, para. 555), and gold “expresses sunlight, value, divinity even” (CW 9i, para. 543). In a footnote on the same page, Jung (1934/1959) observed that, “The colour correlated with sensation in the mandalas of other persons is usually green” (CW 9i, p. 335, n. 134). Jung’s descriptions suggest that the color scheme was not universally applicable and could vary from person to person depending on a range of factors—culture, context, etc. In this way, Jung was not unequivocal about his color scheme, but he did say that, “It happens with some regularity that these colours are correlated with the four orienting functions of consciousness” (1942/1948, CW 11, para. 281). Furthermore, he was prone to insert conditional statements like “usually” when he encountering an exceptional case that deviated from the general scheme. Another individual case study that played a major role in shaping Jung’s understanding of the color quaternity is found in the dreams, visions, and waking fantasies of the physicist Wolfgang Pauli (1900 -1958), who underwent analysis between February 1932 and October 1934 (Gieser, 2005, p. 147). In 1931, Pauli was suffering from depression and frequently had disturbing dreams (Gieser, 2005, p. 142). Besides drinking heavily and embracing a roguish lifestyle, Pauli’s mother had died abruptly in 1927. In December 1929, he married Käthe Margarethe Deppner. The marriage quickly disintegrated resulting in a divorce less than a year later. One could say then that the late 1920s marked a period of personal upheaval and crisis for Pauli, who finally sought out Jung’s help through correspondence in late 1931. Jung, aware of Pauli’s reputation as a brilliant scientist, wished to avoid inadvertently influencing his analytical material or interfering with what would otherwise be an objective process. Jung initially assigned the task of analysis to one of his pupils, a female doctor named Erna Rosenbaum. Pauli worked with Rosenbaum for about five months until Jung took over his analysis. Jung and Pauli’s relationship eventually evolved into a highly creative intellectual partnership which yielded a number of original ideas, including that of synchronicity. That Jung felt it necessary to name Heinrich Zimmer’s work—Artistic Form and Yoga in the Sacred Images of India—alongside The Secret of the Golden Flower underscores its importance to Jung’s study of Eastern Philosophy and religion. In Jung’s extended commentary on the dream material, he correlated the four colors to the four functions of consciousness (1944/1970, CW 12, para. 287). 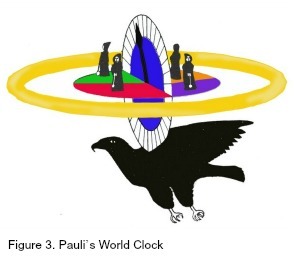 Pauli’s fantasy material culminates in the appearance of what he described as a “great vision,” which principally consisted of a “world clock” (Figure 3). The world clock is comprised of a vertical and a horizontal circle carried on the back of a black bird. The horizontal circle is divided by four sections and four colors, which Jung associated with his typological quaternity. It also merits mention that on the same circle stand four little men who hold pendulums (CW 11, para. 307). According to Jung (1938/1969), “The four little men of our vision are dwarfs or Cabiri. They represent the four cardinal points and the four seasons, as well as the four colours [italics added] and the four elements” (CW 11, para. 120). Given the relative regularity of the appearance of such number and color symbols in dreams of people like Kristine Mann and Wolfgang Pauli, Jung felt that the motifs could be best understood as spontaneous products of the objective psyche, which in his mind lent empirical support to his theories. As previously indicated, prior to 1933, there is no explicit mention of Jung’s rainbow color quaternity. The first reference of it ostensibly appeared in the 1933 Eranos conference which was followed by Jung’s 1934 presentation of Pauli’s dreams. Jung published both papers in the 1940 book The Integration of Personality. During the late 1920s, Jung’s interests began to shift to areas where he could find broader cross-cultural and archetypal consensus for his psychological theories. According to E.A. Bennet (1985), after Jung wrote “The Relations between the Ego and the Unconscious” in 1928 his interest in Chinese thought intensified, which coincided with his reading of Wilhelm’s manuscript on The Secret of the Golden Flower, for which he would later write a commentary. Jung viewed his typology as a western parallel to the Chinese notion of Tao (p. 71). Around the same time Jung started his dream analysis seminar, which took place between November 7, 1928 and June 25, 1930. During this time period, Jung was still working through a stack of fantasy material that originated both from analytic encounters and cross-cultural studies. In the seminar, Jung indicated that he had already read Zimmer’s Artistic Form and Yoga in the Sacred Images of India, which was instrumental to Jung’s psychological understanding of Eastern traditions and likely informed his reading of the Shri-chakra-sambhara Tantra. In the foreword of Artistic Form and Yoga in the Sacred Images of India, Joseph Campbell (1984) wrote that, “The crucial moment was of Jung’s reading of Indologist Heinrich Zimmer’s Kunstform und Yoga” (p. xvi). Thus, the importance of this work in regards to Jung’s understanding of mandala symbolism should not be understated. Jung indicated that he first read the book after writing his commentary for Richard Wilhelm’s translation of The Secret of the Golden Flower (1929) and before he met Zimmer: “I first met Heinrich Zimmer at the beginning of the thirties. I had read his fascinating book Kunstform und Yoga and long wished to meet him in person” (Jung as cited in Campbell, 1984, p. xix). Jung actually met Zimmer in May 1932. The fact that Jung (1984) mentioned Zimmer in his dream analysis seminar on February 26, 1930 (p. 492) suggests that he read it around January 1930. Based on the contents of Artistic Form and Yoga in the Sacred Images of India, one can infer that the material informed his dream analysis seminar in regards to Jung’s understanding of Eastern philosophy and symbolism. The foregoing passage is prescient on three points: 1) Jung (1935/1953) would eventually write a commentary for Evans-Wentz’ (1927/2000) translation of the said work which he apparently read between the date it was published and 1930 (1984, p. 467); 2) the color quaternity—red, yellow, green, and blue—would eventually be imported into his typology; and 3) in 1938 and 1939 Jung gave three lectures on the symbolism of Tantric Buddhism that closely paralleled his abovementioned commentary. The passage above demonstrates not only Jung’s interest in the East, but that as early as 1930 he recognized definite parallels between the structure of Western and Eastern mandalas such as the Tibetan yantra. At this time, Jung had already written his commentary for Wilhelm’s The Secret of the Golden Flower, and his attention began to drift to other fields and disciplines (i.e., alchemy, Kundalini yoga, Tantric Buddhism, etc.). Understandably, the color symbolism would have garnered Jung’s attention when he read the book early in 1930. Around the same time (1930-1931), Jung prepared a two-page manuscript headed “Tantric Texts” which he evidently used in preparation for his lectures at the Eidgenössische Technische Hochschule (ETH), the Swiss Federal Institute of Technology (Shamdasani, 1996, p. xxxiv, n. 66). Shamdasani further indicated that the source material for these manuscripts was Artistic Form and Yoga in the Sacred Images of India (pp. 2-87), wherein can be found Zimmer’s exposition of the Shri-Chakra-Sambhara Tantra. Thus, one could say that what was most essential for Jung was not establishing a universally valid psychological schema predicated on color symbolism but empirically demonstrating a semi-regular chromatic pattern which more or less indicated the same psychological meaning. 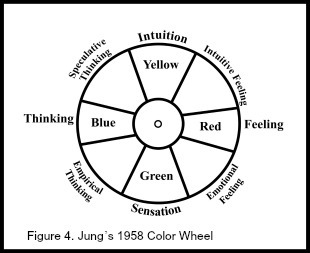 Jung accepted that there would always be some variation in the way the psyche expressed color symbolism. Why in modern times does the unconscious select the colors red, yellow, blue, and green? Although addressing such a question presents a difficult task, Jung left behind a few conceptual clues that may provide at least a partial answer. In On the Nature of the Psyche Jung (1947/1954) introduced the concept of the psychoid factor, which one may define as the part of the psyche that is incapable of consciousness and thus only quasi-psychic in nature. In the same work, he employed the analogy of a color spectrum as an analogy to describe his psychoid concept. With his introduction of the psychoid concept, Jung seems to have expanded his original color scheme into the deep unconscious. Just as the electromagnetic spectrum extends far beyond the limited range of visible light, a psychophysical continuum would comprise a broader range of psychic and physiological phenomena than does consciousness and its four functions (Figure 5). Jung extended this metaphor as follows: “The dynamism of instinct is lodged as it were in the infra-red part of the spectrum, whereas the instinctual image lies in the ultra-violet part” (CW 8, para. 414). Thus, if we were to read the color symbolism in the appropriate context, we could suppose that the psychoid concept is a natural progression of Jung’s typological system. Accordingly, typology comprises the four functions of consciousness whereas the psychoid concept subsumes the totality of unconscious psychic states. Jung’s psychoid concept is understandably difficult to grasp and merits some further explanation. Jung viewed psychic processes as analogous to the concept of an electromagnetic spectrum (Figure 5) on which consciousness slides to the left and to the right. To the left one finds the instincts grounded in somatic processes whereas to the right one encounters the archetypes found in images and ideas. However, either side of the spectrum eventually reaches a threshold that is inaccessible to both image and instincts. On both ends of the spectrum, instinct and archetype gradually fade into the psychoid domain. In Jung’s later work he opined that the archetypes originated from this psychoid domain, which rests on a transcendental substrate. Jung believed however that although psychoid processes are inaccessible to consciousness, through the image-making faculty of the human mind we could expand our reach into those heretofore untrodden regions of the psychoid domain just as through the advent of the telescope our ancestors learned to extend the reach of the eye. The color symbolism also seems to parallel the alchemical idea of the cauda pavonis, for Jung (1934/1959) suggested that “we may expect the miracle of the cauda pavonis, the appearance of “all Colours,” the unfolding and realization of wholeness, once the dark dividing wall has broken down” (CW 9i, para. 685). Thus, one could associate the color symbolism of Jung’s typology with the appearance of the cauda pavonis—a symbol of wholeness. The cauda pavonis seems to herald the gradual broadening of the total representable bandwidth accessible to the human species. Because Western consciousness occupies but a narrow sliver of this bandwidth of psychic energy, Jung’s assertion that, “Psychic processes therefore behave like a scale along which consciousness ‘slides’” (CW 8, para. 408), suggests that the ego could be viewed as a pointer that can move freely, left and right, on a sliding scale of consciousness and thus could eventually access all the colors of the spectrum analogy alluded to earlier. Viewed in this way, the colors symbolize different modes of consciousness, which probably exceed a mere number of four. Jung’s typology then, with its emphasis on four functions and four colors should not be viewed as a complete system for it seems possible, even probable, that the human species has the potential to extend the boundaries of consciousness into the psychoid domain and thereby develop heretofore latent functions within the psyche, whose distinct features can only be imagined. Toward the end of his long life, Jung (1956/1963) intimated that more colors, up to seven, could be included into his color scheme: “Consequently the synthesis of the four or seven colours would mean nothing less than the integration of the personality, the union of the four basic functions, which are customarily represented by the colour quaternio blue-red-yellow-green” (CW 14, para. 390). Bennet, E.A. (1985). Meetings with Jung. Zurich, CH: Daimon. Campbell, J. (1984). Preface. In H. Zimmer, Artistic form and yoga in the sacred images of India (pp. xvii-xxvii). Princeton, NJ: Princeton University Press. (Original work published 1926). Cornford, F. (1937). Plato’s cosmology: The Timaeus of Plato translated with a running commentary. London: Routledge, & Kegan Paul, Ltd.
Evans-Wentz, W.Y. & Karma-Glin-Pa. (2000). The Tibetan Book of the Dead. New York, NY: Oxford University Press. (Original work published 1927). Gieser, S. (2005). The innermost kernel: Depth psychology and quantum mechanics. Berlin, Heidelberg, New York: Springer Verlag. Irwin, J. (1994). The mystery to a solution: Poe, Borges, and the analytic detective story. Baltimore, MD: The Johns Hopkins University Press. Jung, C.G. (1929). Commentary on The secret of the golden flower. In R.F.C Hull (Trans. ), The collected works of C. G. Jung. (Vol. 13). Princeton, NJ: Princeton University Press. Jung, C.G. (1940). The integration of personality. London: Kegan Paul, Trench, Trubner & Co., LTD.
Jung, C. G. (1950). Concerning Mandala Symbolism. In H. Read, M. Fordham, G. Adler & W. McGuire (Eds. ), The collected works of C. G. Jung (R. F. C. Hull, Trans.) (2nd ed., Vol. 9i, pp. 355-384). Princeton, NJ: Princeton University Press. Jung, C. G. (1952). Synchronicity: An acausal connecting principle. In R.F.C Hull (Trans. ), The collected works of C. G. Jung. (Vol. 8). Princeton, NJ: Princeton University Press. Jung, C. G. (1958). Modern psychology: The ETH lectures. Barbara Hannah (Ed.). Unpublished. Jung, C. G. (1996). The psychology of Kundalini Yoga: Notes of the seminar given in 1932 by C. G. Jung. Sonu Shamdasani (Ed.). Princeton, NJ: Princeton University Press. Jung, C. G. (2009). The Red Book: Liber novus. Sonu Shamdasani (Ed.). Philemon Series. New York, NY: W.W. Norton and Company. Kirsch, T. (2000). The Jungians. Philadelphia, PA: Routledge. Lauf, D. I. (1977). Secret doctrines of the Tibetan Book of the Dead. Boston, MA: Shambhala. 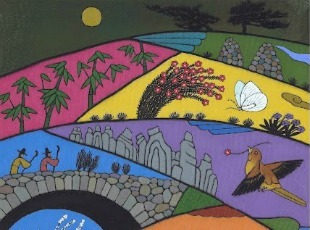 Hee Choung Yi, “In the Mountains,” (2010), Courtesy: Korean Art Museum Assoc. Pietro Longhi, “The Alchemist,” (c. 1757). Courtesy: The Yorck Project. Figure 3: W. Byers-Brown, “World Clock,” (1887). Appeared originally in Synchronicity: The Bridge Between Matter and Mind, (London, 1987), p. 19. Figure 4: Reconstruction of Jung’s drawing, p. 104, ETH Lectures (1958). Might Jung being alive today arrive to an even more evolved conclusion as to the comparison of heightened energy states of atoms emitting of photons at defined wave-lengths may also correlate to heighten states of consciousness in the “psychoid domain”? With differing photon wavelengths equaling the spectrum of visible color, might the mind’s energy level also equate to different levels of consciousness? I absolutely love this! So much information and patterns to trace. Thank you for providing such an article. 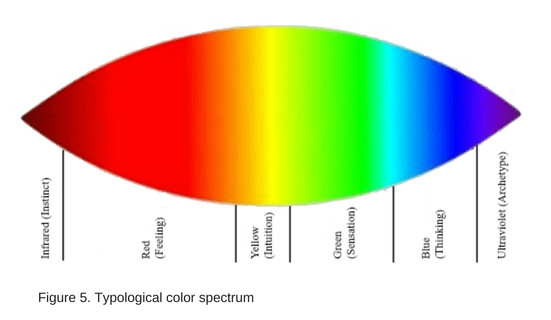 I was wondering if the image of the color spectrum with the functions labeled has an error. Is the red band “feeling” or sensation? There is the image link for you. As a painter/writer, I do appreciate your insightful scholarly article. Thank you for sharing. As you know the color qualities are flexible things–not written in stone; we choose them to represent our feelings, thoughts, intuitions, and perceptions. My preferred way of looking at intuition is the fire that cooks all the previous functions. I must admit my bias. I am an introvert intuitive type with the inferior function as a sensate. is Red of spirit and not yellow of thinking. I am curious as to your informed thoughts. Thanks again for sharing, that is what life is all about. We stand on each other’s shoulder and take a peek into the darkness of unconscious just like the trail blazer wise Jung that we all love. Oh, by the way, I will be in Pacifica for the alchemy seminar coming up the end of August. Love to say hello and shake hands. 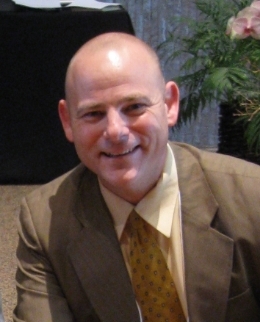 Kiley Q. Laughlin, Ph.D., is writer, coach, and a Lieutenant Colonel in the U.S. Army Reserves based in Northern California. He has supported operations in Bolivia (1995), Bosnia (2003-2004), Iraq (2004-2008), Nigeria (2014), and Kosovo (2009 and 2016). During his multiple deployments, he has liaised with various federal agencies, including the FBI and the U.S. State Department. He has also taught military science at UC-Davis in California and has worked in Veteran Affairs. He is currently writing a book on the evolution of consciousness.